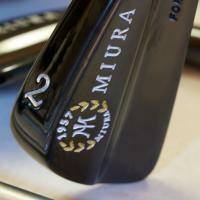 Discussion Miura small blades - anybody have this experience? Miura small blades - anybody have this experience? Just put the baby blades into the bag. I was expecting to play them PW - 6 iron, and keep my CB202s for 5/4. But I crush the 7/6/5/4 irons and can't hit the 8/9/PW to save my life. It's weird. Has anybody had this happen? The mid / long irons are amazing - but I find myself mishitting the short ones in every embarrassing way possible. Weird, right? I CHOOSE to play 6-P. I've always had a man crush on the 9 and PW within this set. 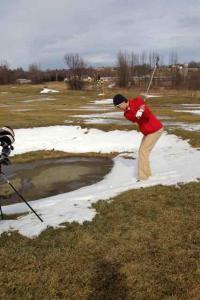 I originally bought the 4 iron too, but I never hit it within a round nor could I hit it. Better off shaving with it. Sold it. Can hit the 5 iron but prefer using it as an aiming stick laying on the ground. Lol. 6-P is my comfort zone. I gotta be swinging just right to get the best of the 6 iron. Too much upright lie angle in short irons, especially wedges, can lead to contact closer to the heel. are your mishits closer to the heel or toe? i think some more info would help. i had some trouble with the 8-pw as well when i got them initially - contact was everywhere - until i realized for some reason i was gripping the clubs too hard, go figure. I had a set and loved them - just got bored with them like all iron sets. Anyway, I had problems with my PW only and found out it was 3 degrees upright - I play my irons 2 degrees flat. Had lie adjusted to my specs and it was good to go - no more issues. I really enjoyed mine, heck even had a hole in one with the 7. However, I could not get the pw to work for me. Like bigmean said I loved, loved the 9 iron. This actually made me only go 4-9 with me cobra pros and match my pw to my sand and lob. Even though I love my Cobras, part of me is debating on another set of baby blades with some amts....minus the pw of course. Interesting....I have been playing my best golf ever recently and other than a tugged PW left yesterday, I have been scoring with it. It went away, but I have thought about a "wedge" style pw as well. The baby blades are amazing irons. I am another year away from needing to consider stocking up good condition used sets of these to be able to have them forever. Do they still make?sell these? Man I wish I had a set of these. Are these your everyday gamers? I can relate. 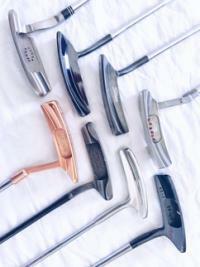 When I first got my baby blades it took me a little longer to adjust to the short irons than the long irons. Once I got used to the look and dialed in the lie angles though (short irons are currently slightly flat compared to long irons), I've been very happy with them. As for the long irons, to this day, I still carry the 2-iron on a very regular basis. Yeah, quick update. Problem solved. It just took some time to adapt to the short irons (though I really don't have a good explanation of why). Also, from a "am I good enough to hit these" perspective, I'm a ~12 handicap, and have been tracking "shots lost" on account of the Baby Blade vs. a GI club (basically, a mishit that leaves me worse off than intended, typically short). So far this year (~50 rounds), I'm averaging about half a shot lost per round, which is pretty acceptable to me, because I do feel like playing these every day has overall improved my ballstriking. The other mitigating factor is that I tend to miss a little bit thin, which results in lower trajectory (and spin), but similar overall distance. Covered in filth and dirt from yesterday's 27 after work as I type this! Ding, ding, ding!!!! Since the day that I first put my 1957s in play, the ONLY set of irons that I've even contemplated putting in the bag for any length of time is my OTHER set of 1957s. I'm tempted by the cb57s. Haven't hit them, but my ideal state (I think) is to have both. ^^^what he said. I currently play the small blades and (counter-intuitively) I love the look of the 4-7, but am still getting used to the look of the 8-PW. My one knock on the small blades is that there is a pretty abrupt visual difference between the 7i and 8i. In the 8i-PW, the goose neck is significantly more pronounced. For me (and I'm guessing for others) this goose neck gives the illusion of significant offset, even though the actual offset is basically non-existing. I previously played (and loved) the Mizuno MP4 blades, and for the above-mentioned reason am debating going back to the MP4s. That said, even if I were to switch, I'd keep the Baby Blades around for the cool factor. I did this. And yea, my CB-57's sit pretty idol. I've had them for a few months now and the only Iron that has been hit is the 6 Iron. The 6 Iron is gamed alongside my Baby Blades (a high lofted Driving Iron so to speak). The 5, 7-P are still unhit. The Baby Blades are too good!! 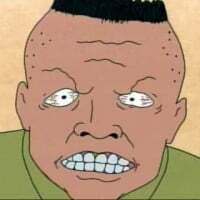 Hmm, the goose neck doesn't bother me much. Actually the 9 is the my favorite club. The offset is not there but the kink is. I will say, the 7/8 transition on my vega raf cms bothered me so much I had to sell them and I really liked that set otherwise so I get it. If there is a mental block it is super hard to get past. Ditto the feeling towards the 9 Iron. with Pw or 9i i find the ball moves in the air a lot more and haven't really worked out how to control it consistently......but overall i wouldn't swap these for any other clubs in the market right now. Following up here, with one suggestion from personal experience; CHECK THE SWINGWEIGHT PROGRESSION within your set. Like a few others have experienced, I was smoking the 4-7 iron but struggling with 8i through lob wedge (I had Miura wedges built at same time as my irons). Having purchased a swingweight scale, and experimenting with my other irons (Mizuno MP4), I'm now pretty confident that I like my 4i-PW to swingweight at D5. 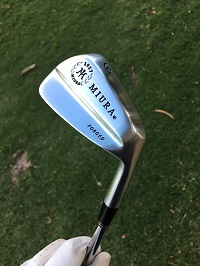 Club Champion built these for me and I wonder if they just measured the 6-iron and assumed that Miura weighted these for uniform SW, as opposed to Miura's stated design of leaving extra weight in the hosel to allow for swingweight progression. In short, I'm gonna take these to Izett and ask them to SW them at D5 throughout the set and see how that goes. UPDATE: As planned, I took these to Izett Golf (amazing local club builder) and had them balance these appropriately, which required removing significant weight from the hosels of short-irons and wedges. These are now back in the bag and feel / perform fantastic throughout the set. Just goes to show...no matter how high-quality the club components, there's no substitute for correct and consistent build quality. Whatever it was, I got over it. Now the 8i is my favorite club in the bag. Could have been swingweight related as I reshafted them at some point. BB step about 8g from 8i-9i and 10g from 9i-Pw. That is true of almost all I’ve weighed and sorted. If you set was not weight sorted, the variations can be slightly greater (eg, if you 7i was on the slightly light side and the 8i on the slightly heavy).